So i have done more UCS Build then i can count, and between some of my colleagues and i, we’ve done hundreds of them by now. So we put together a “UCS Best Practice Guide”, i am sharing it here because i feel that this information should be make public. I have added “Why?” to the line items since many customers want to know why things are done. Again this isn’t the end all be all, just what we found have worked for many customers and makes for a good starting point. This guide is intended to be used on UCS deployments. This guide will detail all of the best practices that have been defined by both Cisco as well as by lessons learned in the field from Subject Matter Experts in the field. This guide will ensure not only proper deployment but also will help ensure consistency. This document is written following the basic installation order and processes. This document is written as a Guideline when existing Client practices aren’t in place, or when asked about recommendations. Client requirements, wishes and needs should always supersede anything written here. This section will list out the best practices for the physical equipment and rack and stacking. 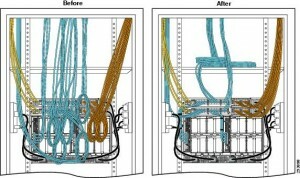 It is preferred to be in two separate racks to provide additional failure domains. Cisco does approve of a “Center of Rack” design as well. Airflow for both 61xx & 62xx are Front to Back. Air enters through the fan trays and power supplies and exits by the ports. Airflow for the Chassis is also Front to Back. The FIs weigh between 35 & 50 pounds each so be sure to account for it. The UCS Chassis can be up to 300 pounds. Ensure equipment is secured using ALL of the screw holes! 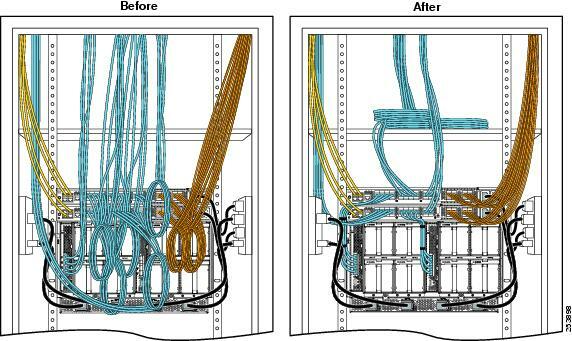 Ensure what will become Fabric Interconnect A is on the top or left, and B is the bottom or right. Typically Left vs Right is looking at the front of the system. Exception: Please be sure to refer to customer requirements on numbering. Chassis numbering should be bottom -> top & left -> right. All Server Ports should be cabled using the leftmost ports on the FI. Since typically its server ports that are added, the next chassis can remain cabled in the correct numerical order. All Uplink Ports should be cabled using the rightmost available ports on the FI. Again this allows spare ports to be for the typically added Server ports. FEX/IOMs should be cabled from top to bottom. Use the shortest possible cables, while ensuring no cables are too tight. Cabling should look closer to the picture on the right, otherwise airflow becomes an issue. This section will provide the configuration best practices for all UCSM items. Do not put any pools, policies or templates under the root organization, create a sub-org and place everything under that. Delete all default pools, which can be deleted. The default setting uses an algorithm that is seemingly random when bigger then 32 objects. Engineer must have patience while working with UCS, you WILL break it otherwise!! The UCSM can have a substantial delay from clicking to reporting back tasks, if you click too quickly tasks can get interrupted or queued and cause major issues. Chassis Discovery Policy should be set to the minimum number of IOM -> FI links. This will prevent any issues down the road relating to chassis being discovered. Link Grouping Preference should be set to Port-Channel. Power Policy should be set to Grid. When setting Unified ports, only the minimum necessary number of ports should be turned into fibre channel ports. Should be done right away as a reboot is necessary. Keep in mind any future expansion the customer may discuss. Primary Fabric Interconnect should be “A” and subordinate should be “B”. Server Ports should be enabled one chassis at a time. This will order the chassis in the correct physical order. If mis-numbered they can be decommissioned and re-numbered. Uplink ports can be enabled in bulk. Set any unused ports to “Unconfigured”. This is for both security and licensing purposes. Resolve any “Fabric Conn” problems before continuing configuration. The remediation steps are disruptive to the environment. Ensure at least 10 minutes have passed from the time the chassis appeared within UCSM. If problem persists, perform a chassis “Acknowledge” and wait for it to clear. Chassis should not be “acknowledged” until all cables have been connected. Ensure that all blades and IOMs show no errors. Update to the latest recommended firmware. Firmware should be no less than 60 days old, unless dictated by the customer or TAC. Engineer MUST read the Cisco Release Notes and understand upgrade process described. These procedures can vary between versions. In addition there are many caveats related to “do not update if” listed. Ensure that your Management Interfaces are specified correctly, including domain. If the Management subnet’s gateway are not pingable, specify the MII Status setting. If this is not set the FIs will assume they are down and attempt failover constantly. Be sure to set the time-zone if not UTC. Be sure to specify NTP Servers. Note: This does not set the time on blades themselves. Be sure check that no “Grace Period” licenses are in use. This will prevent licensing errors on day 121. Download and apply any licenses that were purchased. Most times they come pre-loaded depending on the SKU. Engineer must fully understand RBAC integration processes. The process can be a bit complicated and involves integration with production customer systems. When creating Port-Channels match the ID to the Port-Channel ID of the uplinks on the upstream switch. This is to help simplify troubleshooting and keep items consistent. Set the QoS System Class to match the upstream Nexus switches QoS. It is highly recommended to enable jumbo frames on the best effort and other system classes. Many traffic types take advantage of jumbo frames: vMotion, NFS, iSCSI, Oracle RAC, etc. If they are not set here, setting Jumbo on the vNICs will not do anything. Future troubleshooting is often very difficult. This is due to MTU mismatch at L2 resulting in dropped frames, vs. a mismatch at L3 resulting in fragmentation. Create a Network Control Policy that enables CDP and sets MAC Register Mode to All Host Vlans. This allows ESXi to see the CDP information. This is especially useful when the customer is not utilizing the native VLAN on the trunks, or when the Native is locked down. Create QoS Policies that match up with all the enabled policies in the QoS System Class. This prevents a split pool possibility later on. The Out-Of-Band management for the blades MUST reside on the same subnet as the Fabric Interconnects MGMT port since it uses it for external connectivity. Accounting for number of ports on FI, and number of uplinks to FI, determine max number of chassis possible. This will ensure the customer is create a pool ahead of time for a max number of servers supported. If they don’t plan on growing that big, trim back as necessary. Fabric Interconnects have a maximum possible chassis count of 20. Multiple that number by 8 (max number of blades per chassis). (48 total ports – 4 uplink ports)/(4 uplinks per chassis) = 11 chassis * 8 blades per chassis = 88 total possible blades per UCS Domain. This means you’ll need at least 91 IPs (88 blades + 3 FI IPs) in the management subnet. It is sometimes preferred to double that number in case Service Profile IPs want to be used, however this is not necessary or always possible. This is only a suggestion, follow customer needs. Larger environments will be limited by the 255 host limit. Please plan accordingly. This convention requires MAC pools for each vNIC type, this does increase the initial setup and some management, however a lot of customers like it for better ability to segment the traffic for security, QoS, & Monitoring. This is per UCS domain and increments. Since this is the 2nd UCS at a given DC this will be 2. We are starting at 01 so that the server to ID numbering matches. Recommend starting the pools with 01 instead of 00. Recommend creating a MAC Pool for each NIC type, for each Fabric. Maximum size with this convention is 255 if starting at 01. When any Multi-pathing aware OS is installed. This will make any changes done to the Template propagate to any attached items. Set the appropriate MTU, MAC Pool, QoS & Network Control Policy. If using VSANs be sure to create them. Ensure each VSANs FCoE VLAN is in a high-enough range. This will ensure that it is in a range that will not later on be used by Networking equipment, while making it human-readable to know what the VLAN is used for. It is recommended to add 2 or 3000 to the VSAN ID number. So VSAN 2 would have an FCoE VLAN of 2002 or 3002. Ensure the VLAN # is unique and reserved in the environment!!!!! Do NOT create Common/Global VSANs, they should be specific to each Fabric Interconnect. Each FI should be treated as a separate SAN switch. This complies with typical SAN switch design. This also prevents issues with FCoE where you cannot have the same VSAN on both Fabric Interconnects. Enable FC Zoning for that VSAN ONLY if there is no upstream SAN switch. This prevents the FI from creating zonesets and trying to do an additional layer of zoning that will cause issues. In addition typically the upstream switches do a much better job at handling the zoning then the FIs can. Ensure that your FC Uplink Interfaces are in the correct VSAN. By Default they will be in VSAN 1. If utilizing FC Port-Channels ensure the ID matches an uplink port-channel ID. This helps with consistency as well as future troubleshooting. Create a Storage Connectivity Policy if doing Fabric Interconnect FC Zoning. Use ONLY “Single Initiator Single Target”. This is a best practice that is recommended by almost every storage vendor on the market today. You MUST have a zero in the place that the WWPN’s A or B identifier will go. You MUST place the A or B identifier in the place that the WWNN has a 0 digit in it. Certain Storage vendors will not work correctly without this type of formatted IQN. However it’s recommended to identify it with the future hostname or other descriptive name and number identifier. Name should be simple if using only 2 HBAs. This will keep it easy to understand and use. Either way the name should make sense. HBA-A & HBA-B is a typically used option. Ensure the VSAN selected is correct. This ensures any changes to the template are propagated to all attached items. Ensure the implications of this are understood. Ensure the QoS Policy is set to the previously create FC Policy. These are typically requested items by customers and recommended by the industry. Resume AC on Power Loss to “Last-State”. Set DDR Mode to “Performance-Mode”. When creating Boot Policy ensure “Enforce vNIC/vHBA” is checked. This ensures that the vNIC you want to boot off of is the actual one that it will boot off of. This means you MUST enter the names exactly the same as they will be created during the profile Templates!! If you don’t you will get an error relating to the boot policy. Ensure that you always have CD/DVD as the first boot device. This allows the use of ISO media even if there is a OS on the blade. Otherwise the admin would have to try and catch the boot selection keypress. Unless specified by the Operating System use Legacy boot mode. If EFI mode is selected many Operating Systems will not boot. If doing SAN Boot, Odd # servers should boot of SAN Head A and Even # servers off Head B. This balances the blades and reduces the impact of a Boot Storm. Ensure to set both A & B HBA’s, WWPNs should from both Storage Heads, on their respective fabrics. The drawback to this is multiple Service Profile Templates, so discuss it with Customer. Create a Host Firmware Package and set it to the same Firmware revision as the FIs. Create a Maintenance Policy with a setting of “User Ack”. This prevents any updates from rebooting all of the UCS blades at once. Create a Power Control Policy with a setting of “No Cap”, unless required by customer. This is used as a majority of customers do not setup or use the Power Capping features. Create a Scrub Policy with all Settings to No, unless required by Customer. Policy does not actually do a data wipe. Ensure the Name is descriptive to its purpose as well as any unique features. Use “Expert” mode for adding vNICs. Choosing anything other the “Expert” will be missing important network info. Name the vNICs the same thing as the vNIC Template if possible. This keeps things consistent and easy to troubleshoot. Ensure you select the appropriate Adapter Policy. Use “Expert” mode for adding vHBAs. Choosing anything other the “Expert” will be missing important info. Name the vHBAs the same thing as the vHBA Template if possible. Select “Let system perform placement” on vNIC/vHBA Placement”. Set the Firmware Management policy on the “Server Assignment” page. Set the BIOS, Power Control & Scrub Policy on the last page. Ensure the names of the profiles are descriptive. Best case is use the Hostname of the server as the name, if possible. Put the hostname in the “User Label” section. UPDATE:: The issue was the NIC/HBA Placement Policy. The customer had set a policy to have the HBA’s first, then the iSCSI Overlay NIC, then the remaining NICs. When we moved the iSCSI NIC to the bottom of the list, the ESXi 5.0 installer worked just fine. I’m not 100% sure why this fix is actually working, but either way it works. So at a recent customers site i was trying to configure iSCSI Booting of ESXi 5.0 on a UCS Blade, B230 M2. To make a long story short it doesn’t fully work and isn’t offically supported by Cisco. In fact, NO blade models are supported for ESXi 5.0 & iSCSI boot by Cisco. They claim a fix is on the way, and i will post an update when there is a fix. We got an error installing ESXi 5 to a Netapp LUN. Got an error “Expecting 2 bootbanks, found 0” at 90% of the install of ESXi. The blade is a B230 M2. The LUN is seen in BIOS as well as by the ESXi 5 installer. I even verified the “Details” option, and all the information is correct. Doing an Alt-F12 during the install and watching the logs more closely today, at ~90% it appears to be unloading a module, that appears by its’ name, to be some sort of vmware tools type package. As SOON as it does that the installer claims that there is no IP address on the iSCSI NIC and begins to look for DHCP. The issue is during the configuration of the Service Profile and the iSCSI NIC, at no time did we choose DHCP, we choose static. (We even have tried Pooled) Since there is no DHCP Server in that subnet it doesn’t pickup an address and thus loses connectivity to the LUN. So we rebooted the blade after the error, and ESXi5 actually loads with no errors. The odd thing is that the root password that’s specified isn’t set, it’s blank like ESXi 4.x was. So an interesting question is what’s happening during that last 10% of the installation of ESXi 5?? Since it boots cleanly, it almost seems like it does a sort of “sysprep” of the OS, ie all the configuration details. If that’s the only issue then it might technically be ok. However I don’t get the “warm and fuzzies”. My concern would be that, maybe not today but down the road some module that wasn’t loaded correctly will come back to bite the client. Also, what is happening in that last 10% that’s different then ESXi 4.x?? We were able to load 4.1 just fine with no errors. Again we called Cisco TAC and we were told that ESXi 5 iSCSI booting wasn’t supported on any blade. They do support 4.1 as well as Windows, and a variety of Linux Distos. Here is a nice document to follow to configure iSCSI booting for a FlexPod, ie. UCS Blades, NetApp array & ESXi. UPDATE: This document has the fix i found for ESXi 5.0. This was tested on B230 M2’s and seems to work every time. This document will be updated as i get new information. So i’ve come across this recently. I have a client that is direct connecting the Fiber from their NetApp array to the 6120’s of the UCS. The issue that has been raised is that this is not technically supported. As is seems Cisco releases with the 1.4.1 firmware release that you can absolutely do this. However there is a caveat, it’s supported by Cisco as long as the storage vendor will support it. The biggest problem is that NetApp did support it, but they don’t any longer. So it seems Cisco was left holding the ball when NetApp walked away. So if your running a NetApp array that is direct connected to their UCS w/o an MDS or even a 5548 with the FC module, its no longer technically supported and you very well may run into issues if you need Vendor support. For those not familiar with direct connecting the storage i’ll give a little but of information on it, as well as some of my experiences with it and some tips on making it “work” with UCS. So inside the 6120 there is effectivly a very very dumb MDS switch. There is no Zoning, it is all 1 big zone, you do vSANs, but obviously no inter-vSAN routing, no security, no real way of even getting any initiator/target information for troubleshooting purposes. In order to even use the functionality, you must change the Fiber portion of the switch from “End-Host Mode” to “Switch Mode”. This is EXTREMELY similar in method and functionality to switching the Network side to “Switch Mode”. Intersting note you MUST absolutely make sure the HBA name in the Boot Policy is the EXACT same as the HBA name in the HBA Template, or it won’t boot.